The throng of summer visitors has waved goodbye to the Tetons, but September holds it's own particular brand of things to do in and around Jackson Hole. The summer crowd of visitors has departed, leaving Jackson Hole and Grand Teton Park emptier of traffic which means easier parking and better accessibility in general to all the attractions that make this area special, noteworthy and—above all—truly memorable. 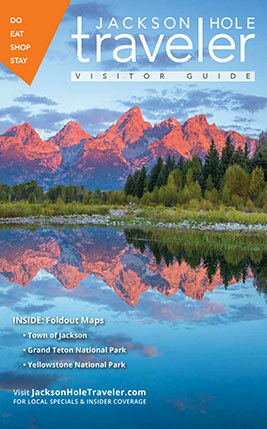 The annual Jackson Hole Fall Arts Festival is perhaps the biggest draw of the autumn season, but let’s not discount all the rest of the varied valley events, the musical and theatrical performances at the Center for the Arts, as well as the other pleasures and activities that characterize September in the Hole. Palates & Palettes Gallery Walk - More than 30 Jackson Hole art galleries open their doors to showcase magnificent art with food and wine; 5-8 p.m.
Fall Arts Festival Historic Ranch Tours - Allow visitors to experience valley ranches where Jackson Hole's cowboy heritage still thrives. This is a favorite Fall Arts Festival event, complete with cowboys, Western entertainment and a good old fashioned barbecue. Hosted by Mountain Living magazine. It begins at 2 p.m., costs $60, and can be booked through the Jackson Hole Chamber of Commerce. Sips on the Square - Jackson Hole Rotary Club's new fundraiser for the Fall Arts Festival. From 11 a.m.-4 p.m., you can enjoy libations from an array of local and national wineries, distilleries and breweries. Each sips ticket is $1. Art Brunch Gallery Walk - Held from 11 a.m.-3 p.m. Enjoy brunch and festive beverages at this closing-day celebration for the Jackson Hole Fall Arts Festival. This event provides the opportunity to visit with gallery representatives and take a closer look at the art. • Take a tandem paraglide flight. Jackson Hole Paragliding offers its morning, into-the-sky adventures until October 9th. Imagine soaring over Jackson Hole Mountain Resort and viewing the awe-inspiring, colorful fall foliage from a bird’s eye perspective. Sure, it may take a little bit of courage to “jump off the mountain,” but you will not regret this once-in-a-lifetime experience. Don’t believe us? Well, read our editor’s first-hand account! • Hear elk bugle. Now here’s something you don’t hear—literally!—every day. September and October is the breeding season for elk. Bulls' “bugling” calls fill the air at dawn and dusk, the result being one of nature’s eeriest concerts. Bulls clash antlers with challengers while gathering and guarding harems of cows. Yellowstone and Grand Teton National Parks are premium spots to observe the rutting elks and catch an earful of their calls, whether from the roadside during a scenic drive or on a hike or bike ride through the woods.